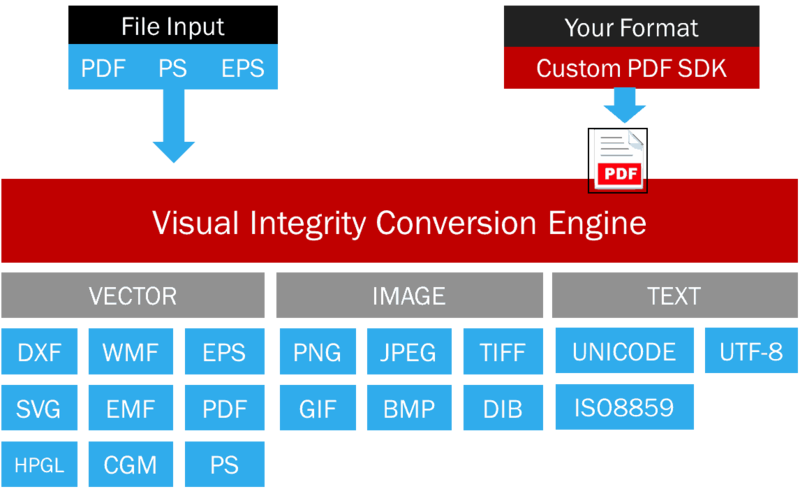 If you need to open PDF files for editing or viewing in your own format, Visual Integrity's PDF Conversion SDK is for you. It's simple, requiring just 2 API calls and a configuration file. The PDF Conversion SDK processes PDF, PostScript, EPS and AI pages and generates industry-standard vector and image formats. It also extracts text. The robust architecture has been designed and battle tested since our beginnings in 1993. Visual Integrity's PDF Conversion SDK is multi-platform, running on Windows, Linux and Mac OS X. It's ideal for everything from enterprise automation and cloud-based applications to web services and workflows. The PDF Conversion SDK supports creating and consuming all PDF versions including the newest standard, PDF 2.0. Editing can be added with the Custom SDK which gives developers access to all object data and text. No printer driver is required. Performance receives a boost because conversions flow swiftly through our proven, robust and standards-compliant conversion engine. Now, you can flexibly implement and develop powerful conversion solutions that are fully compatible with the latest PDF specifications. This guarantees high-performance, scalability, and optimized page processing. If the software you are writing needs to open PDF files for editing or viewing in your own format, Visual Integrity's PDF Conversion SDK is the ideal solution for you. It's used by OEM's as well as corporate developers to embed PDF import and edit technology into their applications. You'l find it in software from Oracle, GstarCAD, TopCon, Ashlar Vellum, Graebert and ProgeCAD. The SDK can be integrated into either a client or server environment with just two API calls. If needed, it can also be accessed via command-line. It couldn’t be easier – or more powerful and accurate. You can depend on the mature and proven libraries which are used in many of today’s leading applications and relied on by OEM’s, enterprises and government organizations worldwide.